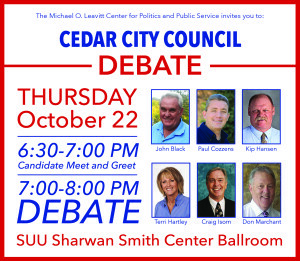 CEDAR CITY – Cedar City Council Candidates will gather together Thursday from 6:30 to 8 p.m. in the Southern Utah University Ballroom for a short meet-and-greet with the public followed by a one-hour debate moderated by the Michael O. Leavitt Center for Politics and Public Relations. 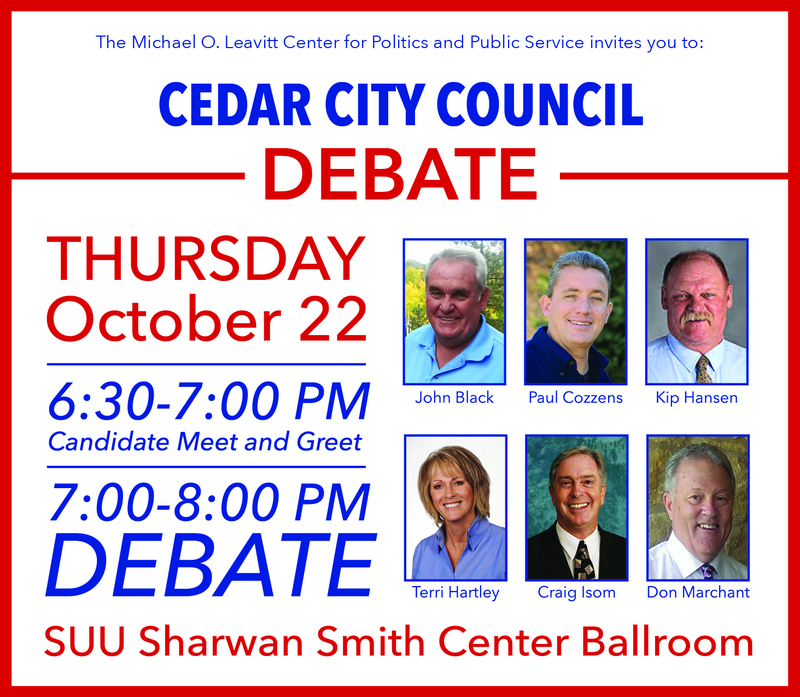 The debate is open to the public and will feature 2015 Cedar City Council election candidates John Black, Paul Cozzens, Kip Hansen, Terri Hartley, Craig Isom and Don Marchant. The three seats opening on the Cedar City Council are currently occupied by Black, Cozzens and Marchant; all three are running for re-election. Hansen, Hartley and Isom are challenging the incumbents in November hoping to claim a chair of their own on the council. The meet-and-greet will be the time for residents to ask the candidates any questions they may have, Leavitt Center Student Director of Marketing and Public Relations Bailey Bowthorpe said, and to get to know them better. The debate is slated to begin at 7 p.m. sharp, she said, emphasizing that there will only be one hour to ask the questions they have determined would be key issues for Cedar City residents, and will have to adhere to a strict schedule. Some of the issues on the table for discussion include regional water issues, budgetary concerns, prosperous economic growth, the unionization of the Iron County Sheriff’s Office and each candidate’s knowledge and skill set that would contribute positively to holding a public service position. Attending debates like these are essential for voters to get to know the candidates and understand how each of them operates and would represent the community should they be elected into office, Bowthorpe said. There are no other opportunities that allow the candidates to come together and answer questions that focus on key issues the way a debate does, she said. The students who moderate the debate work hard to understand what issues are at the forefront of community discussions, Bowthorpe said, creating questions that are not leading but may result in a fruitful response from each candidate. In the 2013 Cedar City election there was a 30 percent voter turnout to the polls, Bowthorpe said. I think this election, really, is crucial because we’re at a turning point in Cedar City – there’s going to be a lot of growth, and so it’s important to have people in there that understand and that can represent Cedar City well.